Stephen Carter, a professor at Yale Law School, has written a new novel in which Lincoln survives Booth’s assassination attempt only to face impeachment for overstepping his authority during the Civil War. The Impeachment of Abraham Lincoln hits bookstores this summer. You can read more about Carter’s novel at USA Today. Musicals are incredibly complex and very hard to direct and produce. They are much harder than other plays. Lincoln is strangely enigmatic in America and that would make it that much harder, yes. And it’s partly the confidence that I had about Lincoln that gave me the courage to tackle this subject and show. But once I started, I soon realized that I was doing something of major significance. Exactly 150 years ago today, Abraham Lincoln signed the Homestead Act into law. This act permitted applicants to claim ownership of undeveloped federal land at no cost, fulfilling the vision of Free Soilers who wanted to settle the frontier with free farmers rather than slaveowners. Before this date, pro-slavery politicians had blocked passage of such an act in an attempt to preserve the ability of the peculiar institution to spread westward, but the secession of the South and the rise of a Republican Congress removed this impediment to a free American West. Author Fergus Bordewich has some reflections on this important anniversary at The Wall Street Journal. You can read more about the Homestead Act’s legacy at the website of The Chicago Tribune. 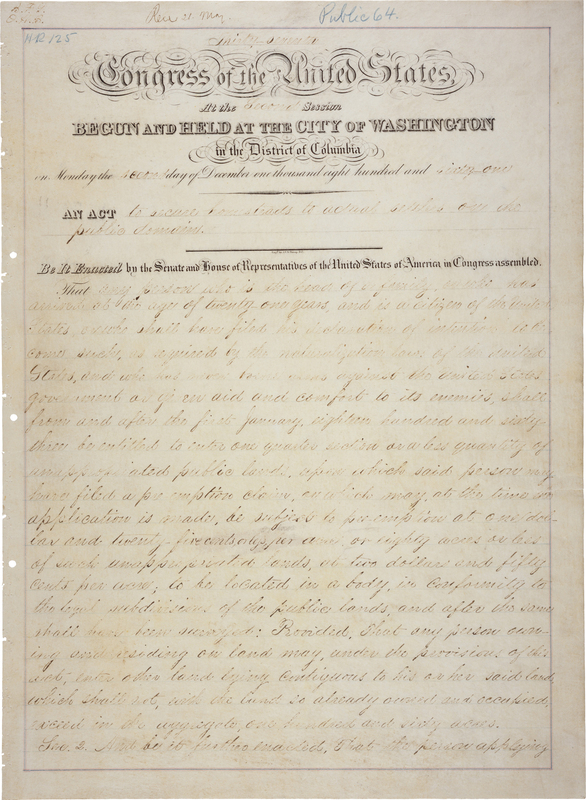 Act of May 20, 1862 (Homestead Act), Public Law 37-64, 05/20/1862; Record Group 11; General Records of the United States Government; National Archives. It’s the only town to be named for Lincoln before he was elected to the presidency, because he played a key role in its founding in 1853. Five years later, during his ill-fated Senate race, he gave a speech on the courthouse grounds, so it seems fitting that the occasion be marked with a statue. You might recall that a vandal recently damaged a statue of a Civil War soldier atop the Lincoln Tomb by breaking the soldier’s sword. The statue has now been repaired, thanks to sculptor Mark Svendsen, who molded a replacement from pieces of the recovered sword. Mr. Juola has spent the past five years developing J Gaap, or Java Graphical Authorship Attribution Program. The software program identifies patterns in written documents — such as syntax use or repetition of certain words — and can use the information it gains from documents with known authors to determine the authorship of other documents. Researchers know that Lincoln wrote anonymous contributions to the Sangamo Journal, a newspaper published weekly in Springfield, said Daniel W. Stowell, director and editor of the Papers of Abraham Lincoln Project. The project exists to identify and publish all documents written by or to Lincoln. But the researchers know that other people also wrote anonymous letters to the paper during the same time period, and there were also readers, including Lincoln, who wrote using pseudonyms. “The challenge was trying to figure out a systematic way and a more scientific way of determining what Lincoln wrote and what he didn’t,” Mr. Stowell said. To meet that challenge, he turned to Mr. Juola and his software program. Mr. Stowell’s team in Springfield has begun compiling and digitizing about 1,000 articles and letters they found in 350 to 400 issues of the Sangamo Journal. They will soon send the digitized newspaper articles to Duquesne, where Mr. Juola’s software will begin to analyze the documents and sort them into three groups: written by Lincoln, not written by Lincoln and authorship unclear. A piece at Investor’s Business Daily looks at Lincoln’s presidency, beyond waging the Civil War and freeing the slaves. Even without these two accomplishments, the historians interviewed for the piece suggest, his administration would have been one of the most significant in America’s history.